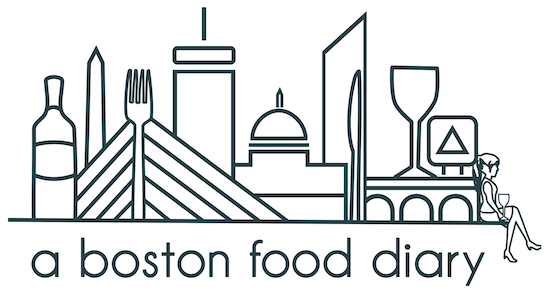 A Boston Food Diary: Ricotta-Veggie Pizza, and hopefully the start of a new tradition! 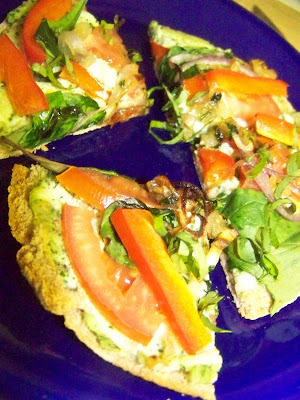 Ricotta-Veggie Pizza, and hopefully the start of a new tradition! Keeping things simple since I was starting later than anticipated, I made the base of my pizza out of a split whole wheat pita. 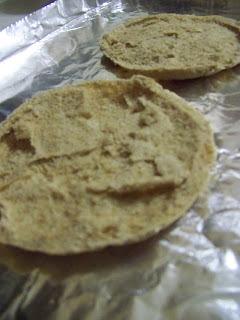 I love the consistency of pita bread, and the whole wheat has such a nice flavor. It's hearty without being over powering. So I split a pita in half and laid each on a baking sheet covered with tinfoil. I also pre heated the oven to 400 degrees. 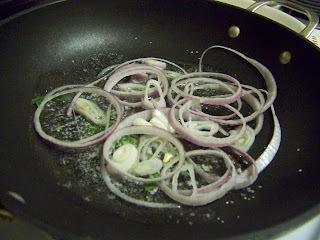 I decided that I wanted some sauteed onions on my pizza, so I thin sliced just two slices of onion, and added them to a saute pan with a teaspoon of butter, and kosher salt. I stirred these every so often as I got together the remainder of my pizza ingredients. My next step was putting together the base of my pizza. 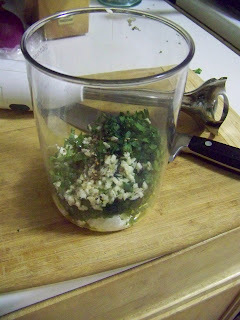 In a container perfect for my immersion blender, I combined a half cup of fat free ricotta cheese, salt and pepper to taste, chopped garlic, fresh parsley and basil. Then, just to ease the motor of my poor blender, I poured in just about a tablespoon of olive oil. In went the blender and a few moments later I had a lovely creamy puree of ricotta, and gorgeous herbs. To this mix, I added just a handful of shredded low fat Italian cheese mix (I believe its a mix of Mozzarella, Asiago, Parmesan and Romano). I didn't want this to be blended too much, so I simply stirred it in post blend so that the shredded feeling remained. 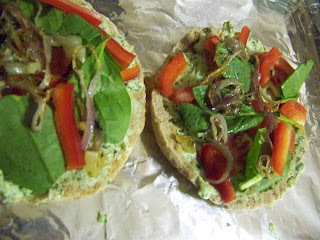 Then, I spread the cheese mixture on top of the pitas, and began to layer on "toppings". A couple slices of tomato cut into chunks, half a red bell pepper sliced thin and then crosswise to make small pieces, some fresh baby spinach, and then over the top, some of the sauteed onions. Once assembled I put the pizzas in my 400 degree oven, and cooked for about 10- 15 minutes- until the cheese was hot, and the veggies had started to get some color. 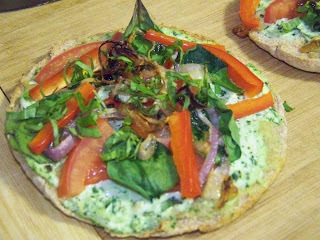 Once out of the oven I topped with some finely sliced basil for just a bit more fresh flavor. I have to say-this was a successful first Pizza Friday! 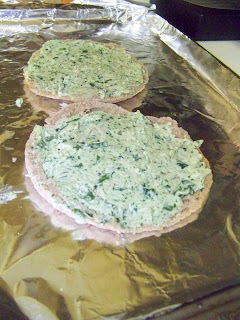 The blended ricotta had wonderful flavor between the garlic and the fresh herbs. 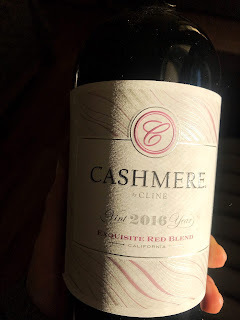 Even though it was creamy and gave the impression of decadent-it was also very light. The shredded cheese had melted nicely and lend ed itself nicely to the gooey feel of pizza without all of the added grease that then we all blot off. The veggies were perfect as well. The pepper maintained a bit of crunch to it and was very sweet compared to the other very savory ingredients, the spinach was nice and hearty and the tomato gave some nice refreshment for contrast. Finally, those onions were a treat when you got one. I had added a fair amount of salt to the onions, but not so much to the cheese mixture so the onions added a really nice salty kick that amped up the rest of the flavors. They were sweet and a little smokey, and just a completely different flavor and texture from the rest of the toppings. This was a delicious variation on pizza and one that I'll definitely be making again very soon-though I cant wait to start dreaming up other ideas for Pizza Fridays! This looks delicious! I'm smitten with the idea of make-at-home pizza, now that I tried Iggy's pizza shells - they're great and make the whole process easier. I'm bookmarking this for a future trial - thanks! Oh that is good to know! Iggys makes some great things! Let me know how it turns out for you! This looks/sounds so yummy, and healthy! I'm surrounded by vegetarians in my life, so I'm always looking for new recipes. Thanks!